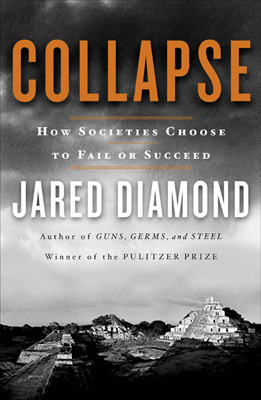 2005: Pulitzer Prize winner Jared Diamond summaries the threats in “Collapse”, now a free book! 1972: Limits to Growth is still on track! Their original paper summarised their concerns in this graphic in Nature magazine (Sept 2009). 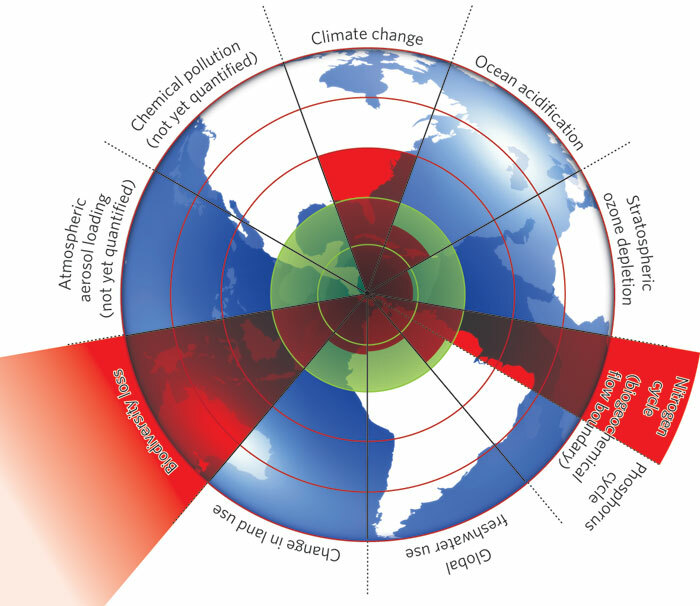 The inner green shading represents the proposed safe operating space for nine planetary boundaries. The red wedges represent an estimate of how we’re going. Three limits have already been crossed with terrible consequences in biodiversity loss, climate change and the nitrogen cycle. The 2015 update confirms we are still exceeding these 3 boundaries. It’s all pretty dark, but here’s the good stuff. They are credible, they are describing the limits, and they are recommending policies. THE most authoritative scientific report on the planet’s health has found water, land, air, plants, animals and fish stocks are all in “inexorable decline” as 2007 became the first year in human history when most of the world’s population lived in cities. The United Nations’ Global Environment Outlook-4 report, released in New York, reveals a scale of unprecedented ecological damage, with more than 2 million people possibly dying prematurely of air pollution and close to 2 billion likely to suffer absolute water scarcity by 2025. Put bluntly, the report warns that the 6.75 billion world population, “has reached a stage where the amount of resources needed to sustain it exceeds what is available”. And it says climate change, the collapse of fish stocks and the extinction of species “may threaten humanity’s very survival”. Launching the report, the head of the UN’s Environment Program, Achim Steiner, warned that, “without an accelerated effort to reform the way we collectively do business on planet earth, we will shortly be in trouble, if indeed we are not already”. One of the most disturbing findings is that environmental exposures are now causing almost one quarter of all diseases including respiratory disease, cancers, and emerging animal-to-human disease transfer. Pressure on the global water supply has also become a serious threat to human development as the demand for irrigated crops soars. The report estimates that only one in 10 of the world’s major rivers reaches the sea all year round because of upstream irrigation demands. Each person’s “environmental footprint” has on average grown to 22 hectares of the planet but the report estimates the “biological carrying capacity” is somewhere between 15 and 16 hectares per person. 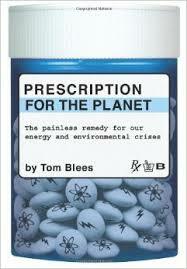 Critically, fish stocks, a key protein source for several billion people, are in crisis. About 30 per cent of global fish stocks are classed as “collapsed” and 40 per cent are described as “over-exploited”. What is the Millennium Ecosystem Assessment (MA)? The Millennium Ecosystem Assessment (MA) was called for by the United Nations Secretary-General Kofi Annan in 2000. Initiated in 2001, the objective of the MA was to assess the consequences of ecosystem change for human well-being and the scientific basis for action needed to enhance the conservation and sustainable use of those systems and their contribution to human well-being. The MA has involved the work of more than 1,360 experts worldwide. Their findings, contained in five technical volumes and six synthesis reports, provide a state-of-the-art scientific appraisal of the condition and trends in the world’s ecosystems and the services they provide (such as clean water, food, forest products, flood control, and natural resources) and the options to restore, conserve or enhance the sustainable use of ecosystems. Jared Diamond won the Pulitzer for “Guns, Germs, and Steel.” He conclusively proved that rich local resources (including easily domesticated animals and grains) accelerated the rise of early cities and civilisations. This is also one of my favourite arguments against racism, showing that various people groups were not smarter, just luckier. Early villages thrived when they were geographically placed in environments that were rich in biological and mineral resources. The Pulitzer was well deserved, and eventually PBS made the TV mini-series. His next major work analysed the other side of the very same equation — how societies failed when they did not respect the limits of their environments and resources. Indeed, even the title of the book “Collapse: How societies choose to fail or succeed” drew complaints from more conservative critics. In May 2007 Diamond gave a presentation for Conservation International at the American Museum of Natural History, New York. His thinking seems to have crystallised and condensed the information in “Collapse” as he summarised the risks to our economic prosperity — and even civilisation itself — into 12 key points. Scientific American was there: listen to their podcast online or read the key paragraphs below. “People are worried now… …People have good reasons to be concerned. In the past there have about 8 different ways by which human societies hammered environments by destroying habitats, exterminating species, overfishing, deforestation, soil erosion, introducing exotic pest species, and other ways. Well all of these old ways of hammering the environment are continuing, but now we also have 4 new environmental problems. Namely, releasing toxic chemicals into the environment, Global Warming caused by humans, bumping up against the photosynthetic ceiling, and energy problems…. Combinations of these old problems dragged down the most advances societies in both hemispheres in the past, and they are threatening to do it again today. All of these dozen problems are like time bombs with fuses just a few decades long, because world societies are already on a non-sustainable course, and our trajectories for each of these problems will run out in a few decades if we don’t change our course. 1972: The Limits to Growth is still on track! If you read the 35 year review by the CSIRO (and another 40 year anniversary review of the book), you’ll see that we are still pretty much on track for massive societal collapse mid century!